First (introductory) part of my tutorial series on artistic airbrushing techniques in GIMP you can find [here]. 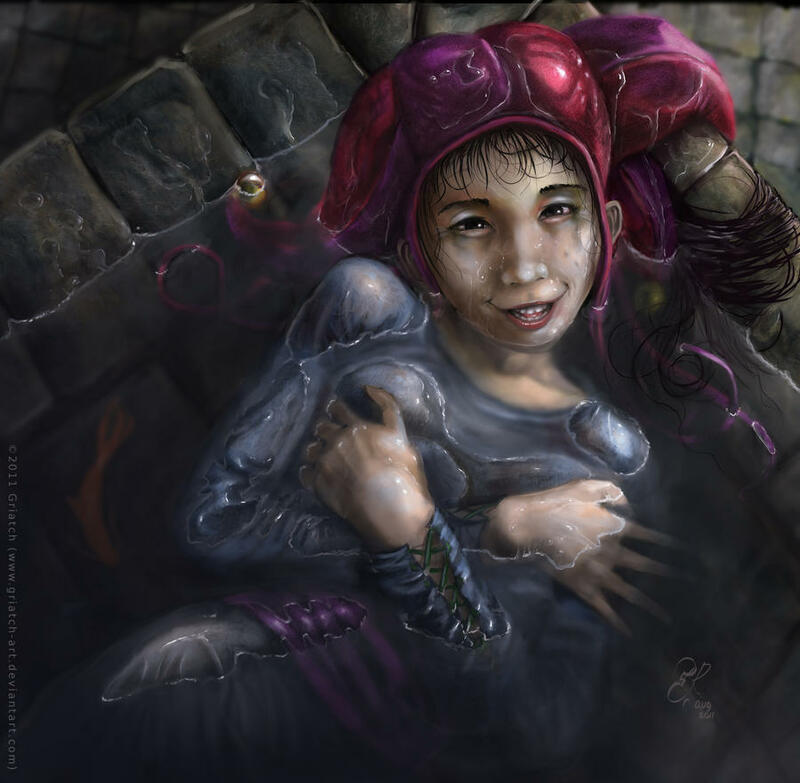 In this tutorial we will step by step use GIMP's airbrush and the smudge tool to create a more complex piece of art from scratch. 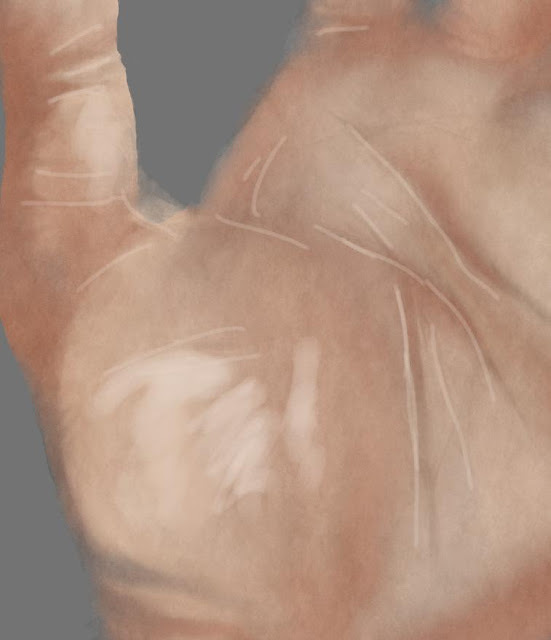 You will learn how to paint human skin and will end up with an image of your own hand (or mine, if you use my sketch). There are not that many advanced "GIMP tricks" in here, but you will still need to have a grasp of how to operate basic functions, apply filters, selections and so on. But mostly this is a tutorial on workflow, how to use the airbrush (and smudge tool) creatively to achieve nice effects. So it's as much an artistic tutorial as one on how to use GIMP. This means that this is a rather advanced tutorial that requires some patience and preserverence to go through. 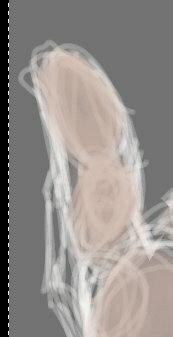 But if you do I can guarantee you will have become better at handling the mouse and the GIMP tools to draw creatively. This tutorial is the second part in a set of tutorials where I try to teach how to use GIMP's powerful airbrush tool to create a more complete piece of artistic-style art. I will assume you have read the previous tutorial in this series -- you can find it [here]. In that tutorial you tried using the airbrush to draw straight lines, and then used those straight lines to make a dead tree. Many tried that, with cool results. Now we'll try something more advanced. 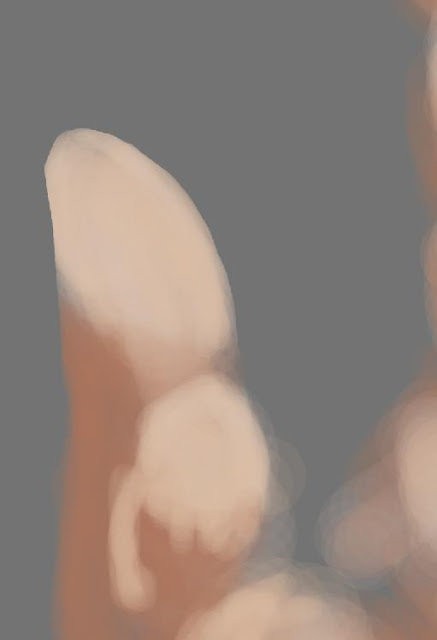 From tutorial one, you should have resizable brushes set up. That is something you really need to have for convenience when drawing actively. Furthermore, you should have a grasp on how to draw good lines with the mouse. Try the exercises in Tutorial 1 if you haven't already or think you need to "re-acquire" the feeling for it. I will draw this tutorial with a mouse too, just to show that it can be done also without a drawing tablet. You also need to set up the airbrush properly. You need to set it to an opacity of 50%, mainly. For the other settings, like pressure and rate, take a look at pictures in tutorial 1. Without these settings you will not be able to reproduce the steps we will take in this tutorial. 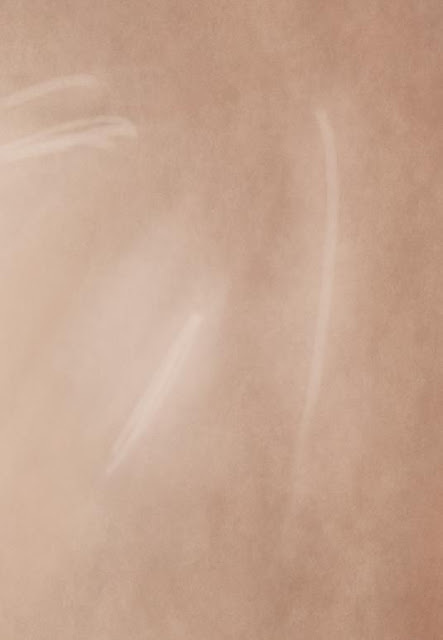 A new thing not mentioned in the previous tutorial is setting up your smudge tool properly for subtle effects. You need it to be less "smudgy" and more forgiving. This screenshot shows the settings I've used in this tutorial. Especially the low opacity at 30% value is important! This allows you to create better transitions with this tool. Finally, for the sake of your own sanity, learn the keyboard shortcuts! You will need to change between tools all the time, and you shouldn't have to move the pointer away to the toolbox. The main tools you'll use here is the airbrush and the smudge tool. Their default shortcuts are 'a' and 's' respectively. Flip between layers with Page up and Page down, also a critical shortcut. Also, the "pick colour", accomplished with Ctrl+ left mouse click is a vital thing to know for this tutorial. The zoom in/out are other shortcuts worth knowing and of course the resize-brush shortcuts you should have already or have set up in tutorial 1. This is what we will create in this tutorial. 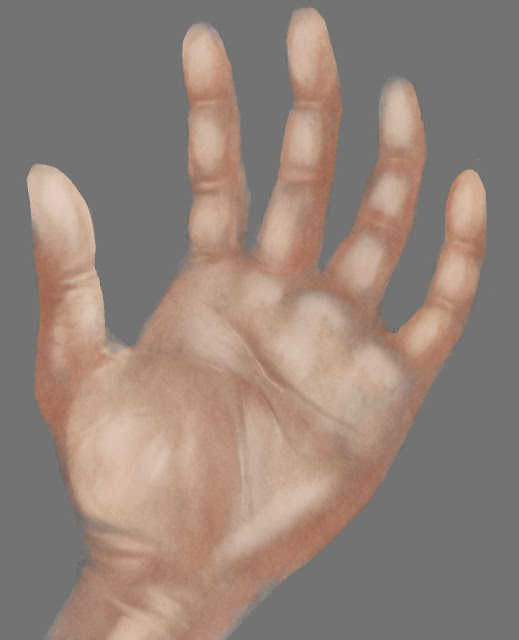 The hand is a suitably complex yet accessible thing to draw, since most people have two of them available in front of them for direct reference. This is my hand, try to picture yours instead. I want to in advance apologize for some lack of proper anatomy in my example image, it was drawn quickly for the sake of this tutorial so there are a number of anatomical faults in it -- things I would normally have seen and corrected had I spent more time on it. I leave such corrections up to the readers instead. This is my setup in GIMP (The images in this tutorial was done with GIMP 2.2, so the interface looks a little different from later versions. 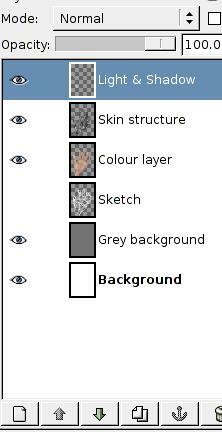 This tutorial should work the same also for later GIMP versions though.). Create a new image with A4 size 300 dpi (for Americans, that's an image 2480x3508 pixels large). If you cannot make out the Airbrush settings in this image, look at tutorial 1. Create two new transparent layers, one you fill with flat grey for the background and another you name "sketch" plain and simple. We will from now on work on the sketch layer only. Note the zoom -- despite the image being so large, we keep the entire image in view all the time. Don't be tempted to zoom in yet; we picked such a large image size in order to up our resolution. If you start working on only a small part of the canvas you'll loose that advantage and should have picked a smaller image in the first place. Use your canvas! 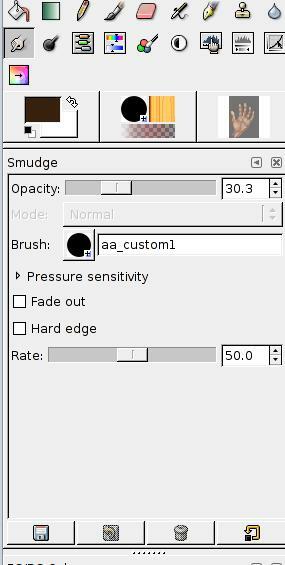 Select the airbrush and scale down the brush to a moderately small size (use your round, resizable brush you learned to set up in tutorial 1). 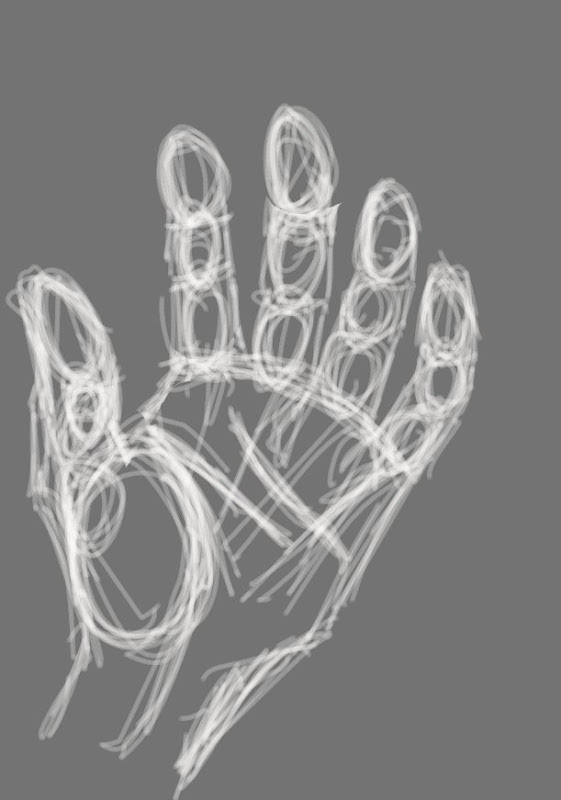 Hold up your off-hand in front of you and sketch it with quick, sloppy strokes. I used white for sketching here; it doesn't really matter what colour you choose as long as you can see it. Try to first make a stick figure of your hand, then make small ringlets for the joints of your fingers and outline your hand. As you can see, it can look very messy, the main point is to have the basic layout down. Note: I know some have expressed trouble with sketching on the computer. So in order to allow everyone to follow this tutorial and not get stuck at this step, you can download the above image and scape it up to fit a large canvas. If you use my sketch, you should later hide the sketch not just by hiding it, but by simply placing a new flat grey layer over it. Also note, that the anatomy is not very good in my sketch, so you'll inherit my mistakes too -- but it will do for the sake of this tutorial. Create a new layer above the sketch layer. Work only on this layer until I say otherwise. Pick a moderately light skin-tone colour. Pick one you can imagine both having darker and brighter versions of later -- so don't make it too bright or too dark. This is called a mid-tone, and I will refer to this one colour as such all time from now on. Choose a large brush. We will not do detail yet, just blocking in colour. Start applying your mid-tone in circles. Only use that one single colour for now. Don't change. Remember, if your airbrush is set up correctly, you will produce more opaque colours the more times you move the brush over the same place. Use that, rather than going for a new colour in the palette. Work fast, in small rotating movements. For now, just apply colour on the main surfaces of the hand. Here we have finished applying this thin layer of (one) colour, just laying out the main areas of colour in the image. This is a sort of "flat" colour image, but the power of the airbrush is already showing, lending structure to the image. 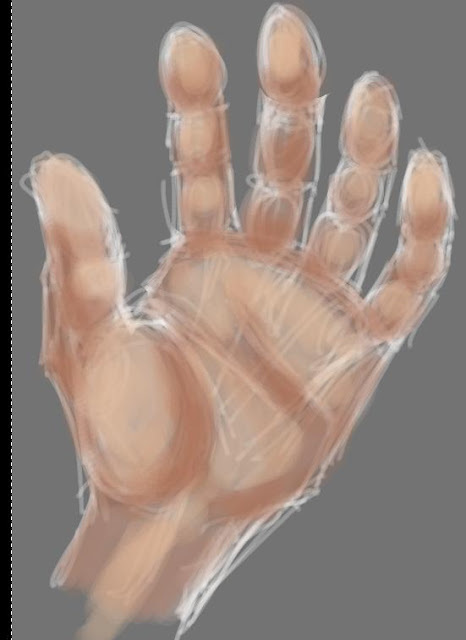 Next we need to establish the main shapes of the hand -- the 3D structure if you will. Pick a colour darker than your original mid-tone. Size up your brush a lot, so you can cover large areas at a time, but shrink it to roughly fit the fingers when you get to them. 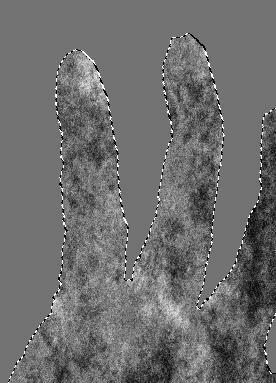 These aren't really shadows, they are just regions of the hand which are angled towards you, guidelines to realize the shape. Don't be tempted to use any more details than shown here, and stick with the airbrush tool only. Next we shift the midtone colour slightly towards brighter and fill the regions the darker tone didn't go before. 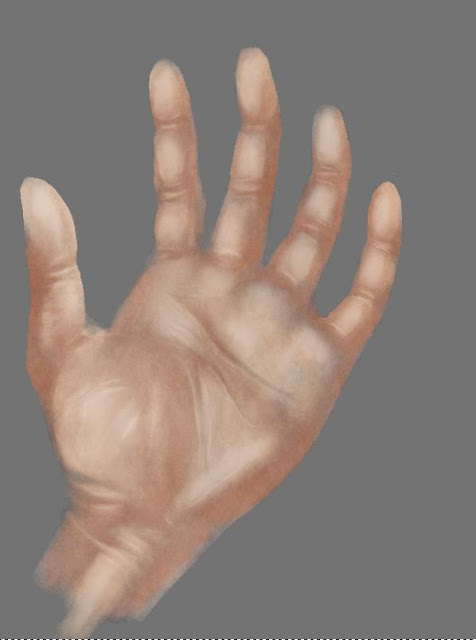 This is the main "fleshy" parts of the hand. Remember, use a large brush and apply in small, spiraling strokes. We're starting to see the structure of the hand now! We shut off the sketch layer now (If you use my sketch, create a new grey layer just above the sketch to hide it). You can turn it on and off a few times to add to the blocked colour if you think you missed something. But after this the sketch will not be used anymore. 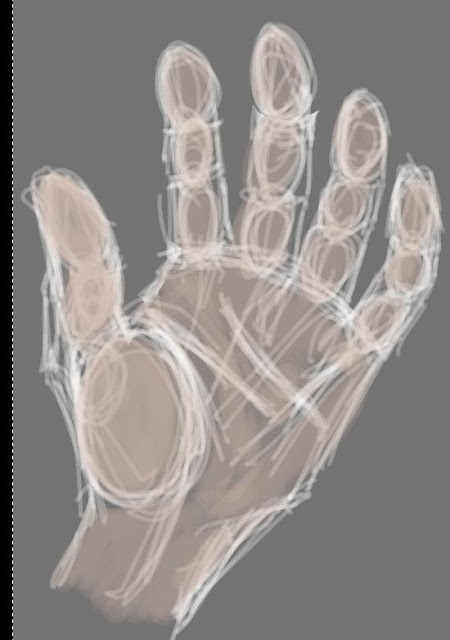 We have a rough estimate of the 3D structure of the hand, and that's all we wanted. Keep working on the same Colour layer. Now you can zoom in a bit. Pick (i.e. Ctrl-click) to get the mid-tone colour and start applying this colour more densely. Don't do any smoothing or smudging, just use the airbrush. Use the eraser tool to cut away the "blurriness" around the edges. 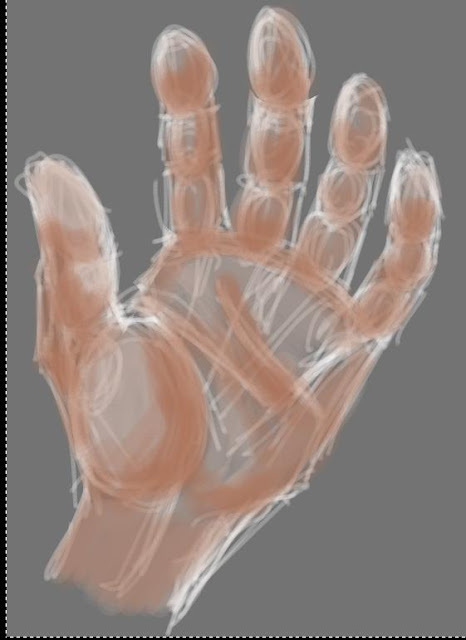 This is your chance to reshape and refine the outline of the hand. Compare to your own hand. Take advantage of the colours you already have in place, using the Ctrl-click to get the colour in the region you're working in. Think of it as an image out of focus that you are gradually bringing more and more sharpness to. We're not in focus yet though, leave it at about the level of detail shown in the picture. Here we're working on the side of the hand, shaping it by cutting away the blur with the eraser. The hand is starting to look more solid when we have gone through it all. But right now the structure is a bit rough. (This is an image of the root of the thumb if you didn't see that). If you haven't already, save your image. Better yet, save a copy of it, so you can get back to this stage again if you think you messed up. Pick a large brush and start working in concentric circles along the edges between light and dark. This is very much something to experiment with, and comes down much to experience. You want to stretch the skin more smoothly over the muscles of the hand, show that the skin holds together all over. You want to blend the edges, but not so much that you loose the structure you have already spent so much work building up. Take your time here and check out the following two pictures for applying this to different parts of the hand. 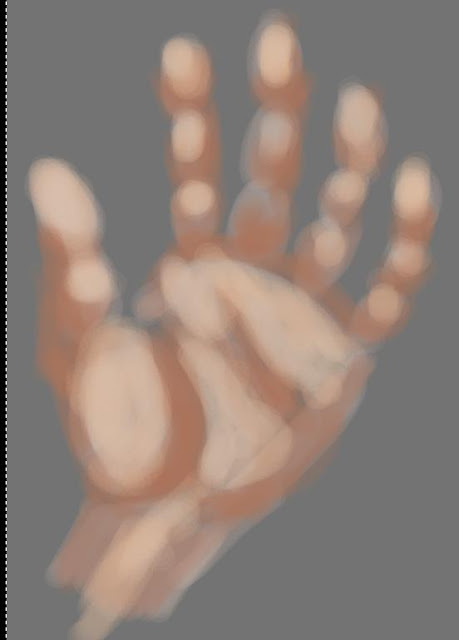 Keep using your smudge tool with a slightly smaller brush for the fingers -- not too small though, or you'll start seeing individual lines appear. Remember, use circle movements. You can still produce rather complex shadings while rotating, think of it as dragging coloured clay into other patches of clay ... or something. Use the zoom and the eraser to further prune away at the outlines of the fingers if you need to, but be careful. Time to start bringing the hand into focus. 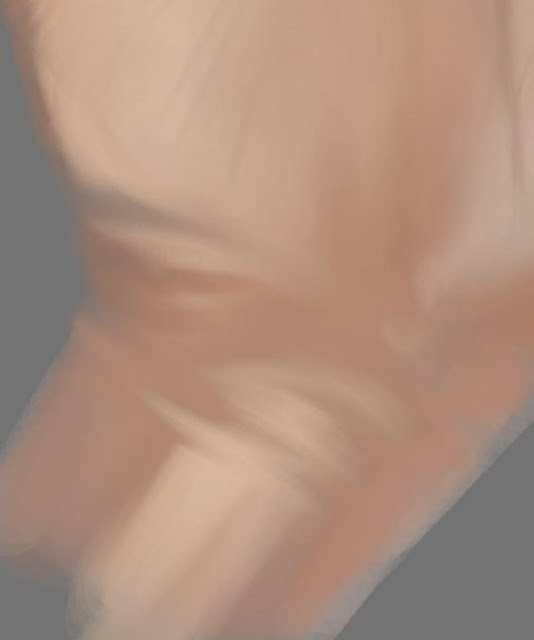 Still with the smudge tool, now go to smaller brushes. 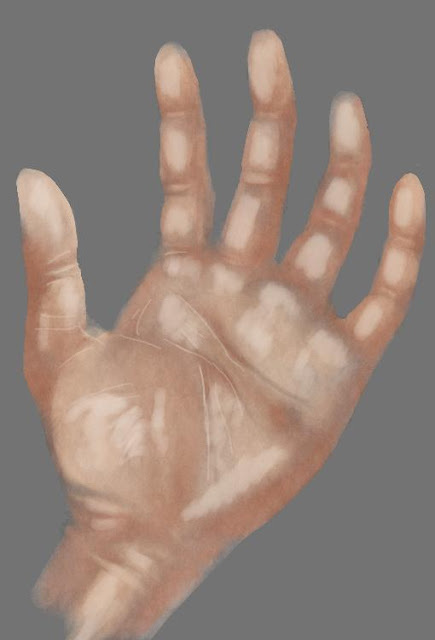 'Drag out' the dark patches gradually with the smudge tool to expand the maze of wrinkles in the inner of the hand. If you have too large patches of dark you can't change with the smudge, switch temporarily to the airbrush ('a' key), Ctrl-pick the colour you want and place a blob of colour there. 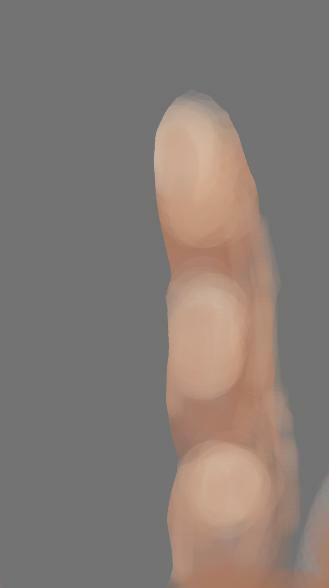 Then back to the smudge tool (shortcut 's') to smear that blob out into the form you want. That was how the separation between the two main folds was created above (compare the previous image). Remember, use the smudge tool for this. 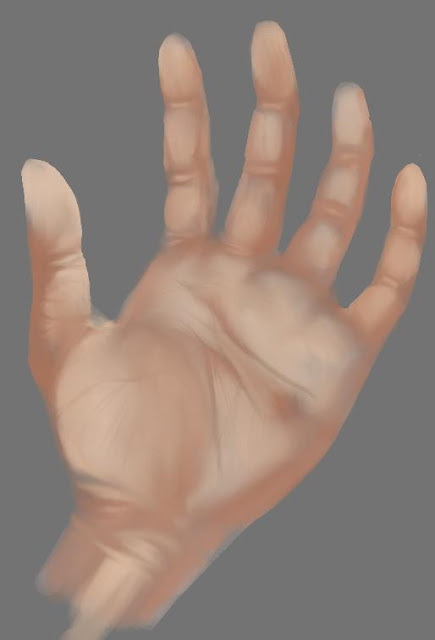 It can feel like slow work, but the main technique you're learning is to repeat the same stroke over and over -- clicking and dragging the mouse over the same area over and over is the only way to have the smudge tool produce results over long distances. Train and try and you'll hopefully get the hang of it. So, once again -- none of the lines in this image was made by actually picking a new colour and "painting" it. All we've done is use the existing colour already there and let the smudge tool do the colour matching and blending for us automatically. A piece of the thumb, the main fold. 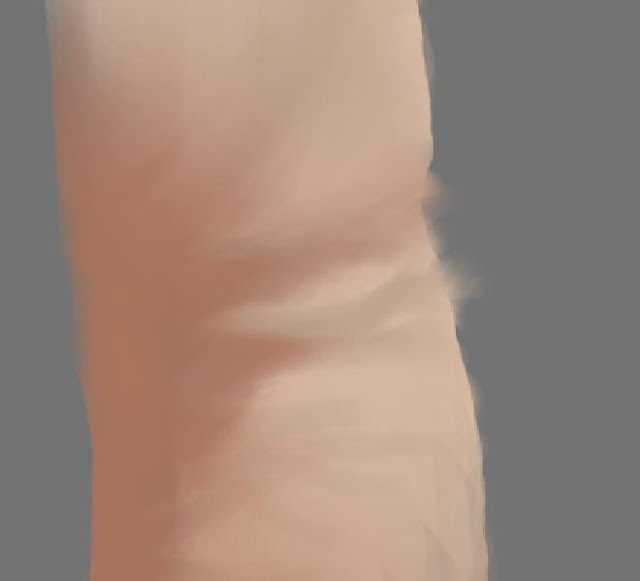 Use the smudge tool to define the folds with vertical strokes. Cut away excess colour with the eraser tool. Work around the hand, this is the wrist. Use a large brush and the smudge tool to drag out the existing colour into wrinkles. In this image we have even dragged the fold in from the edge, letting the background colour of grey shine through here and there. 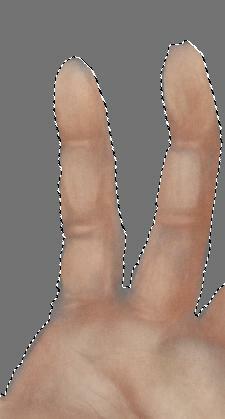 Detail of fingers. The joints are usually two folds with a brighter patch between them. 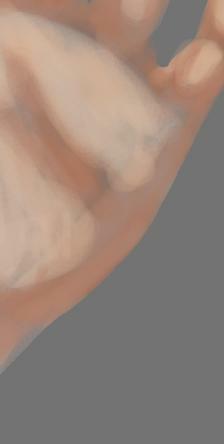 Use the airbrush if you need to add some skin colour in the folds, use the smudge tool to refine it. After having established blurring and the first level of details, we have this result. It's reasonably realistic, but it's still rather bland. A hand is not just smooth. There are millions of tiny irregularities in and under the skin that changes how the skin reflects light. Blood vessels run around under there, changing and modifiying the colours on a small scale. There are ways to mimic blood vessels and really go into details on the pores in the skin.  Here we will settle for just giving more "grain" to the skin for increase realism. We will now use the only digital trick we'll use in this tutorial. Use the "select continuous region" tool to select all of our hand.  Create a new layer called "Skin Structure". Use a rather high turbulence (see image). This will create a multi-colour fill over our hand. Use Layers->Colour->Desaturate to remove all those icky colours. Set your "Skin Structure" layer to mode "Overlay" and drop the opacity of it to about 25 percent. You can experiment with this if you want. It shouldn't be too obvious, but at least the hand looks less even now. Create a new layer above all the others. This is the "Light & Shadow" layer. Above you see the layer structure of our image. We won't need any more layers than this. Time to start applying highlights. Now we return to the airbrush. Choose a colour a bit brighter than your mid-tone and start working on your new "Light & Shadow" layer. With the airbrush, splotch out patches of brighter skin colour over the protruding parts of your hand. Also use a smaller brush to trace some of the folds and wrinkles you did before. Don't use pure white for this! Pick a bright pink or something, white is too extreme. Having placed these splotches over the hand, this is what you should have. Now it's time to bring out the smudge tool again. In a similar way as you did before when you blended the mid-tones, you now blend the highlights. Be careful to make the thinner lines smooth, but try not to make them disappear completely. For extra highlights, you can try to make yet another set of bright lines in the center of already bright areas. In this image, we have begun to smudge these lines into the background (see the rightmost line's lower part). These highlights should be subtle; the hand is not high-polished. 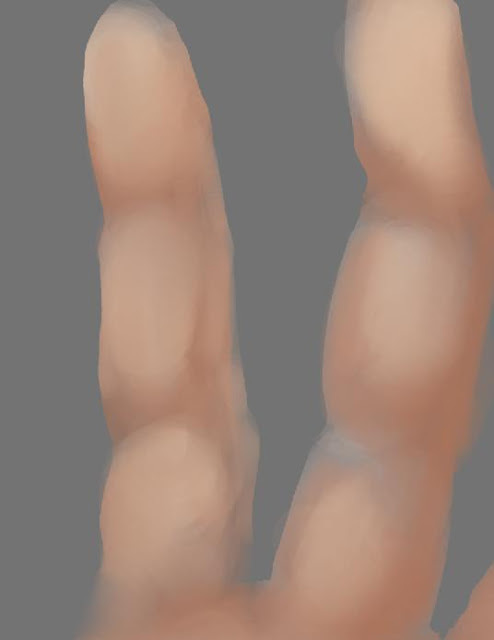 I leave it up to you to correct the anatomical flaws in this; I consider this mainly a tutorial on colour techniques and workflow rather than on anatomy. With this you should hopefully have gotten plenty of experience with both the airbrush and the smudge tools as well as an idea about how to draw human skin and how to lay out colour and plan a picture. You should also note how few times we went to the palette to pick a new colour. I think in total we picked only 4 colours explicitly from the palette to use in this picture -- the mid-tone, darker, brighter and the highlights colours. But as you can see there are now far more colours in the picture than four! The airbrush and smudge tools made all the colouring work for us. This could be a nice base image for further development; It has for example very limited environmental shadowing as it is, so you can put whatever you want on it. Another thing is that the edges are sharp from cutting away with the eraser. If you want to blend this into a proper image, the edges should be shadowed and blurred to become properly part of the background. Also the colour-shades should be changed to reflect the lightning in your scene. ... and that concludes this tutorial. I hope it's able to give some ideas and inspiration. Just trying it out is also a good way of getting experience with making art on the computer. If you try, please post your result, it will be fun to see how it goes!